There’s certainly a market for such a lofty read. As a personal finance blogger who encourages people to never let an adversary take advantage of them, I routinely hear readers complain about what horrible negotiators they are. Apparently lots of people just can’t or won’t implement the unbendable axioms of negotiation – reject the first offer, walk away when you don’t feel comfortable, say no and mean it, etc. Babitsky and Mangraviti open by painting a striking picture of a young Vietnam veteran who suffers a horrendous accident at work, becomes a quadriplegic, and gets a payout from his insurance company that barely covers toothpaste and floss. That is, until a hero comes to the rescue – a personal injury attorney, who just happens to be one of the authors. It’s too much to expect that Babitsky be the one modest attorney in the universe. There are multiple places in the narrative where the authors could have been humble, but they’re lawyers. They’ve never lost a negotiation, never been taken advantage of. They even refer to themselves as “sophisticated negotiators” who “went to prestigious schools”. “We’re very organized people” and “high-powered lawyers”, a trite phrase that I thought only journalists use and that makes me wonder why there’s no such thing as a high-powered civil engineer or a high-powered cruise director. Like most contemporary non-fiction authors, Babitsky and Mangraviti repeat themselves incessantly. The book is about 23% longer than it needs to be, but keep in mind that most books in this genre are about 70% longer than they need to be. As amateur writers (giving out impenetrable papers at legal conferences doesn’t make them professional writers), B&M make the traditional rookie mistakes: For instance, don’t call me “the reader”. Engage me. I’m one person, just like everyone else reading Never Lose Again. It wouldn’t kill you to call me “you”. I won’t go through all 50 questions, but take Question 1. “How did you hear about us?”, is something you’re supposed to ask of a buyer. The authors posit that you don’t necessarily care how he heard about you, you just want to get him talking. Any information he gives you makes the situation asymmetrical, and knowing more about your opposite number than he knows about you is always good. That theme runs through all 50 questions – lie, pretend to be interested, lie, determine whether your adversary is more susceptible to vinegar or honey, control the agenda, lie, and then lie. 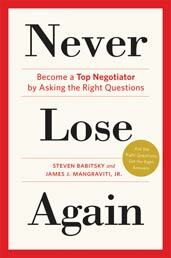 The authors include anecdotal examples of their own negotiating brilliance. Between them they got a piece of jewelry at 60% off, got 33% off the fees one credit card company charges, and got 35% off a phone bill. They make it sound as if Sprint or CenturyLink is willing to knock a huge chunk off your bill, and all you have to do is ask for it. But don’t kid yourself. If you’re responsible for .0001% of your phone company’s revenue, they’ll let you walk before giving you 8 free months of service and apologizing for not offering it to you in the first place. The authors admit that when they’re operating as sellers, they themselves don’t budge on price. No learning curve whatsoever. They came out of the womb as killer negotiators. Some of the advice in Never Lose Again is idiotic, e.g. if a potential business partner asks you to send him an email saying what you want to discuss before you meet in person, you should say, “I would like to explore all avenues of potential synergy where we could possibly produce a win-win relationship.” That’s an actual quote, and given the tone of the book it’s hard to imagine that they intended such mockable Corporatespeak as humor. Are there any fresh, original ideas in the book? A few. The authors do invert one piece of conventional wisdom, getting a price out of the other party first. Rather than do it that way, they argue that you should anchor instead. One of the questions is “Can you do the job for $x?” They argue that’s you never want to give the other party time to think about the question. Even if your opponent typically charges $2x or $5x for such work, hearing your lowball number will apparently make him second-guess his entire pricing strategy and cede to your demands instead. Beyond that, every page contains a parable, maybe even a semi-true story, about how one author or the other reduced some buyer or seller to a sniveling mess via robust negotiating prowess. There’s value in the book – it’s Ulysses compared to some of the other attorney-penned garbage I’ve reviewed – but slogging through the authors’ endless chest-thumping can be tedious. On the other hand, the book is a way to hire an attorney for a few hours for $26 total. Better still, read the book’s 3-page conclusion and put its lessons into practice instead. Awesome thanks for the book review. It’s always good to get a tip on which books to read and avoid. Great review. Doesn’t sound at all like a pleasant read, though the anecdotes are probably entertaining. There’s some worthwhile information in the book, just not enough to justify its price. A lot of the examples are written for, well, attorneys who need to close deals and negotiate contracts. The parts that can benefit us laypeople are few and far between.